By CECILIA S. ANGELES Manila Bulletin Publ. Corp. Despite applying sun block cream on my uncovered skin, I still got a good, lasting souvenir from my Cambodian trip when I went there together with a friend from Sta. Barbara, California, Maria Macabio, who is also a photographer. And that was sunburned face, arms, and legs. We were among the thousands of tourists around the world, falling in line and waiting under direct sunlight for our turn to climb the Angkor Wat temple in Siem Reap City, Cambodia. The Khmers were prosperous from the ninth to the thirteenth century, but deserted the place in 1443 because of the constant attacks of the Thai armies in the fourteenth and fifteenth centuries. The ruins of Angkor remained buried in the jungle until French archeologists started restoring the heritage ruins at the end of the nineteenth century. 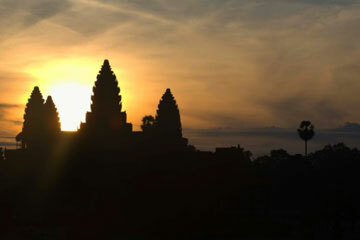 Until now, Angkor Wat has not been restored completely, for time destroyer seems faster than human restorer. According to our tour guide, some two million tourists around the world visit this heritage place yearly. Every segment of the man-made structure dedicated to Hindu god Vishnu amazed me, including its long entrance lined with heroic busts of gods and the two mile water-filled moat around Angkor Wat. I could simply imagine that this ditch was an effective defense from Thai invaders. To climb the 130-feet-high main tower was the obsession of tourists like us, so we waited for our turn under the sun. At the tower, people below looked like ants in size. That was how high the main tower was. There were four other smaller towers on each corner of the ancient structure. Solid walls displayed carved pictures of Hindu epics. Our tour guide had fluently mastered the scenes, settings, characters and plots of the tale, much, much better than my English major students of Asian Literature. All areas of the huge walls of the temple displayed sculptured scenes to picture Hindu dancing gods in their worship hours. Visiting even the smaller towers on the four corners of the temple gave me an imaginary experience to live in the past. There was a room, the only room that echoed every word we said and noise we created. Tourists who did not trust their knees or grip remained on the ground, yet Angkor Wat has never denied them a sensational Cambodian experience of its historical world heritage.